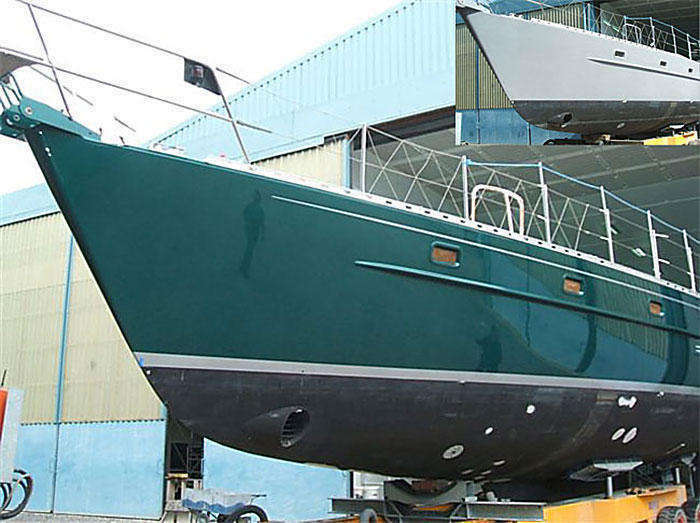 Having completed a round-the-world cruise in 2003, Truant emerged from her mothballed state in 2010 for recomissioning work: forward cabin alterations, corrosion control and a complete respray to complement a marine electronics package upgrade. 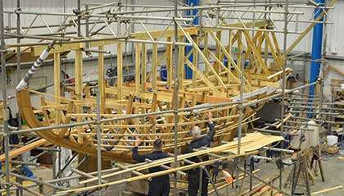 You can view the various stages of the refit by exploring the menu on the left. 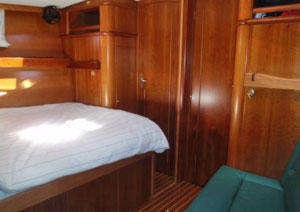 Starboard side cabin. 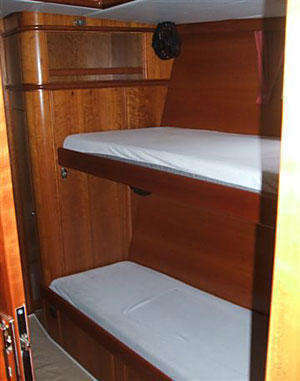 This original layout consisted of two fixed upper and lower berths. The owners had identified that when the boat is in “passage mode” it is best to have the original layout of two separate cabins for guests and crew or to split the kids up! On arrival at destination their preference was to have a single open cabin layout with a double bed one side and seating area the other for their guests. The concept is good, but the owners’ need for little or no compromise between the two formats, whilst still retaining the same high standard of joinery finish and an original look, made for a lot of head scratching on the part of the project manager and shipwright foreman. 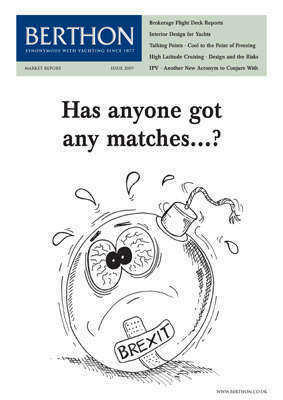 The end result however speaks for itself. 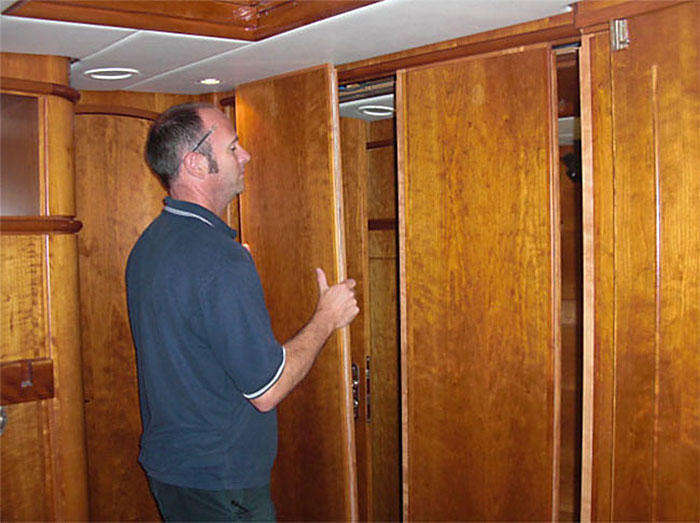 Although the boat had completed a round-the-world-cruise, carrying the owners, their young children, guests and occasional crew, the boat’s internal cherry joinery still presented “as new” and is a real credit to their care and attention. 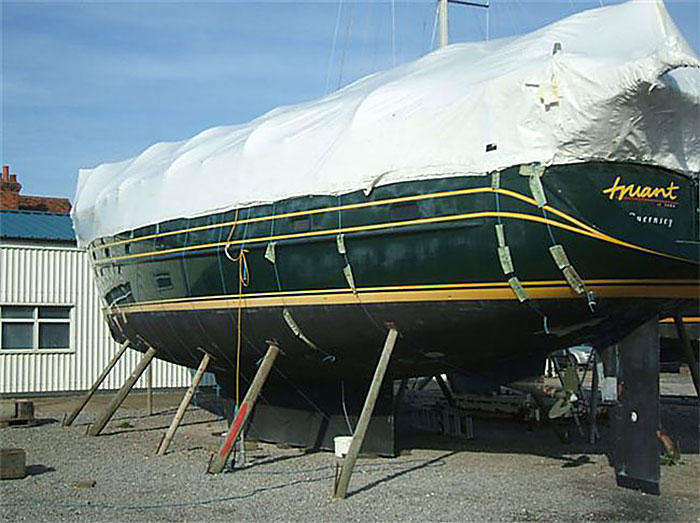 Our first task was to keep it that way by the application of protective coverings to the teak decks, internal soles, vertical surfaces and the companionway steps. 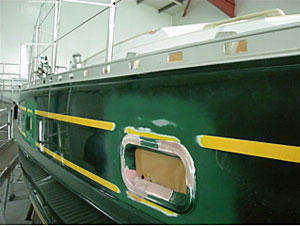 The upper fixed berth has been carefully removed with a view to re-using as much of the original cherry as possible. A new Pullman berth has been made to the same design as the original port side cabin. This berth stows flush to the boat side when the new seating is being used. Deployment is a matter of pulling the lee board up and out, then drop into the slot in the solid cherry timber supports attached to the aft bulkhead and aft hanging locker. 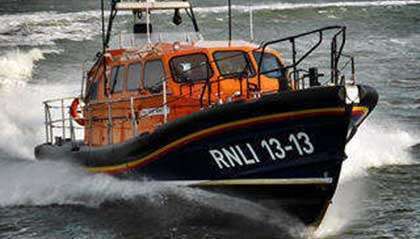 The lower seating area can be quickly converted back to a normal berth. The original layout of the port side cabin (figure 3) consisted of a single fixed lower and an upper pullman berth. You can see the removed centre bulkhead(figure 4), with walk through access to the hanging locker as well as the left in section of bulkhead that forms the double bed base side. 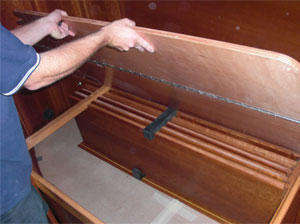 The bed base converts from single to double by means of a hinged bi-folding section. You can also see the new seating on the starboard side. 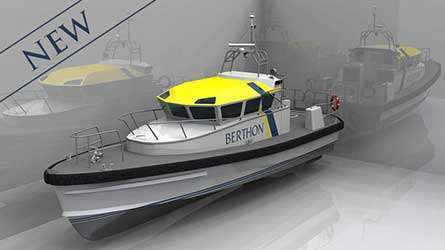 To be able to convert the cabins from two singles to one double and back again requires removal and refitting of the central bulkhead. 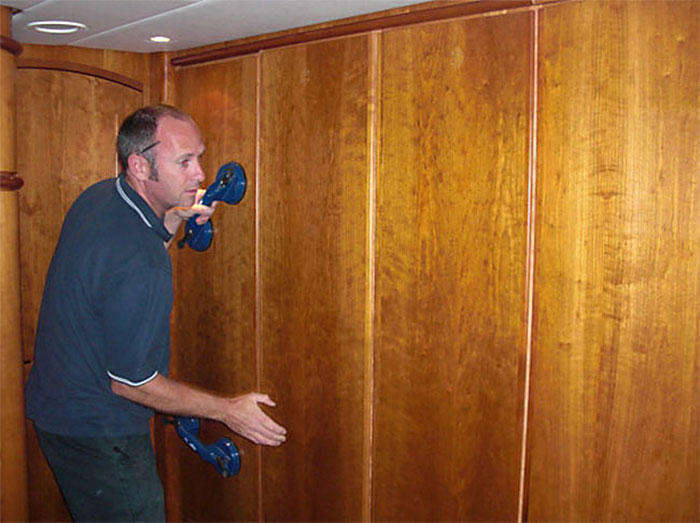 To keep the interior looking as original as possible and to avoid the obvious colour differences from new to original timber we decide to reuse as much of the original cherry paneling as possible. 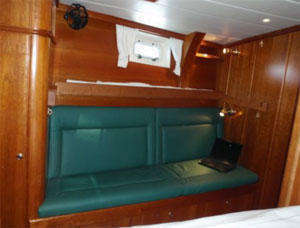 The bulkhead panels were masked up and carefully cut away leaving the section that forms the double bed side in place. The original panels (figure 6) were then cleaned up and machined ready for fitting of solid timber inserts to form a tongue and groove arrangement that allowed the panels to be slotted into place reforming the central bulkhead. 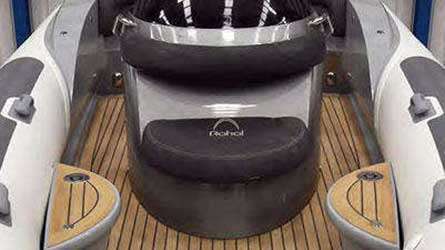 What to do with all the bulkhead sections when in single cabin mode? A place for everything and everything in its place by way of clever stowage. Also shown is the double bed base being folded into position. Conversion from double cabin to single and vice versa takes some 30 minutes and in both modes looks like it has always been that way. Truant of Sark following her refit and respray. 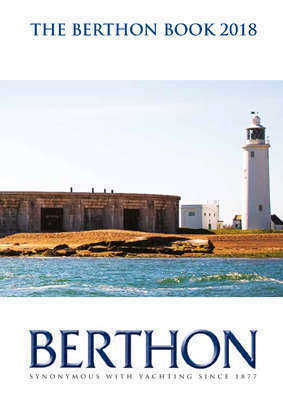 Prior to respraying, Truant underwent Berthon’s recommended corrosion control process to the superstructure. 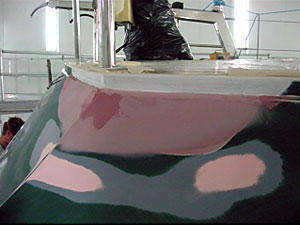 This allowed the newly painted surface to extend below the new teak margin board to reduce/delay recurrence of corrosion. The details of this process are shown below. 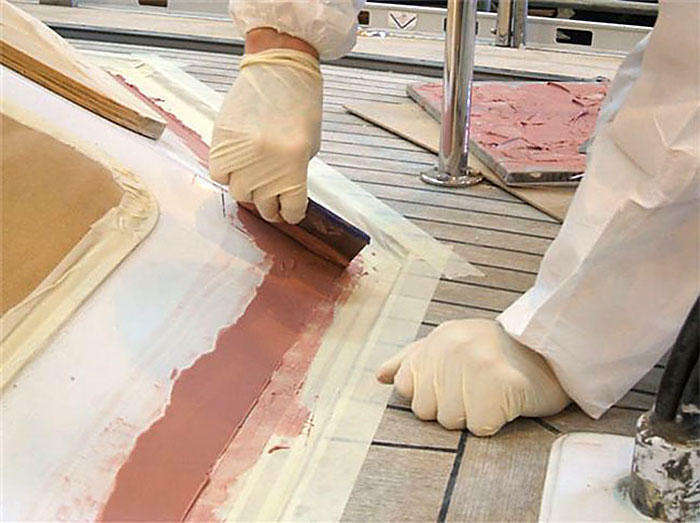 As part of painting the superstructure, the teak deck margins boards were carefully routered away to remove the teak (figure 1), but the ply sub deck was left intact. 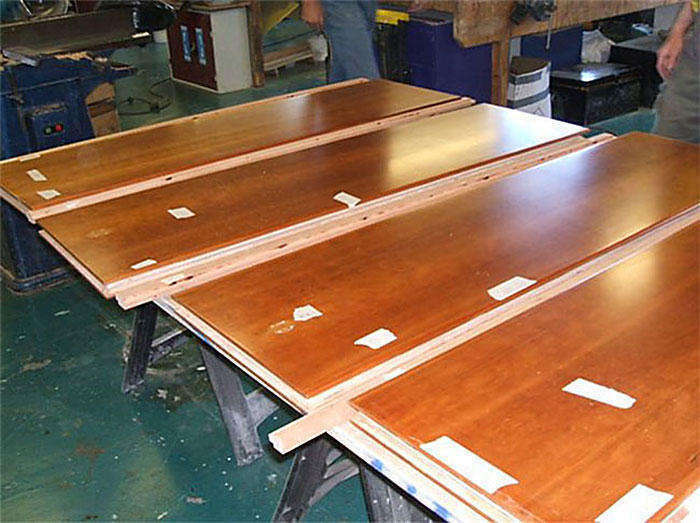 Prior to this templates of the margin boards were taken with Mylar sheeting (as you can see through it), then the profiles were transferred to make plywood templates for production of new teak margins to be fitted on completion. 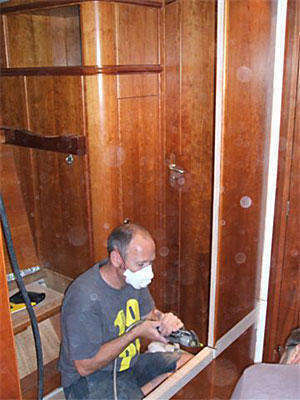 This was fairly detailed work, taking care not to damage the snapes of the remaining planking. 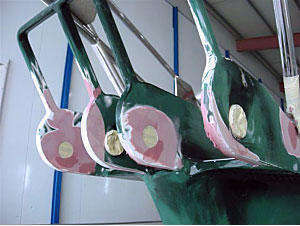 The areas of oxidation were ground back to hard metal to remove the corrosion in the aluminium structure; then masked up, primed and filled (figure 2) as shown by the white primer and red filler. Once cured the filler was faired in and needed some spot filling and further fairing before priming again ready for the gloss top coating. 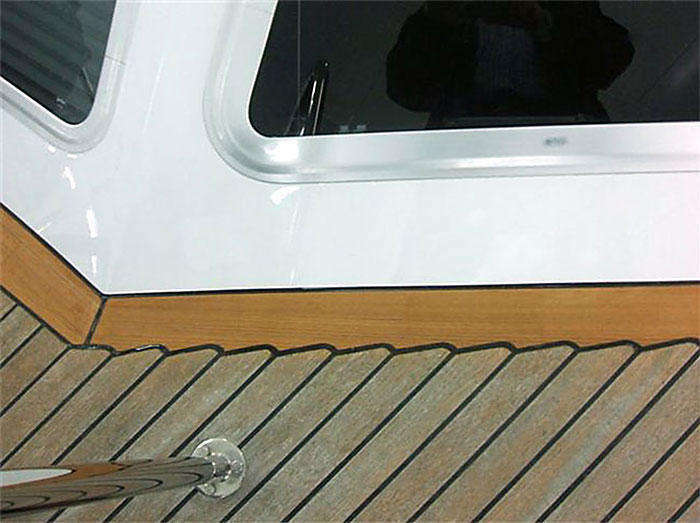 Following priming and gloss coating, the new teak deck margin boards were bonded down to the sub deck and the caulking seams paid up (figure 3). 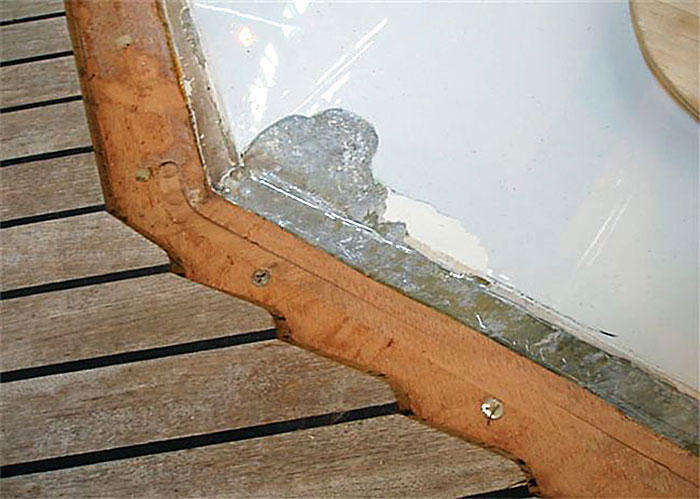 This completed the recommended process for a repaint to allow the newly painted surface to extend below the new teak margin board to reduce recurrence of corrosion. After some 7 years in storage, which followed lots of UV exposure in hot climates around the world (see the white blemishes above and around the boot top), Truant of Sark’s topsides paint was not looking its best. 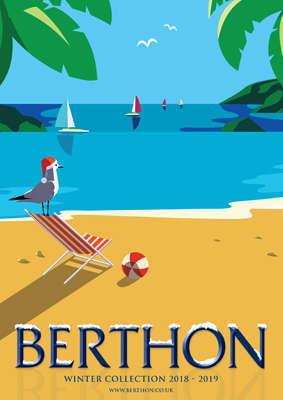 The colour and lines layout, although distinctive, was also in need of an update. 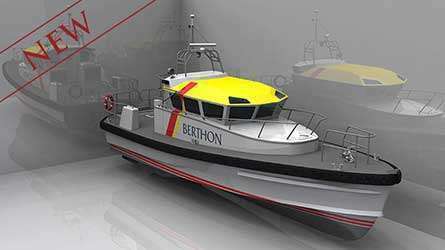 This was the opportunity to give her a fresh new look ready for new adventures (figure 1). 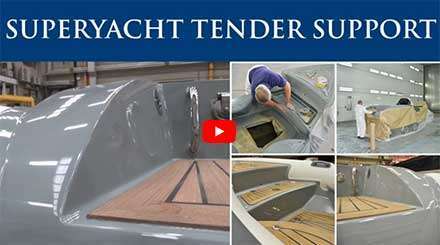 Truant, an aluminium Nordia 55, was moved to the Berthon paint preparation area for corrosion control to the usual suspect areas on an aluminium boat: the stem head (figure 2a), around the deck edge (figure 2b) and around the portlights (figure 2c). The pictures opposite show these respective areas that have been ground back to hard aluminium, primed, filled & faired and then primed again, ready for a gloss coating. 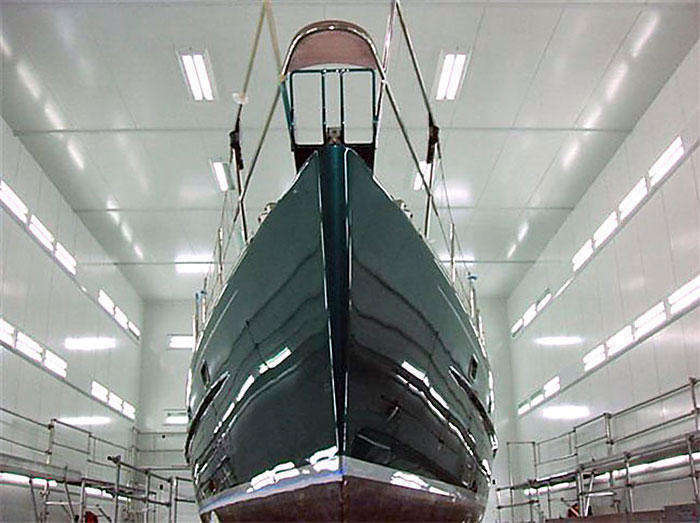 Following extensive corrosion control, prepping and priming, the boat was moved from our paint preparation area to our glossing booth (figure 3). 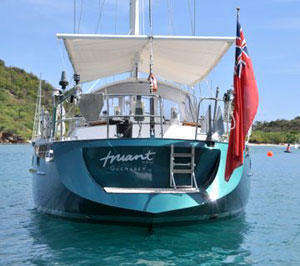 The paint chosen for Truant was a metallic green. 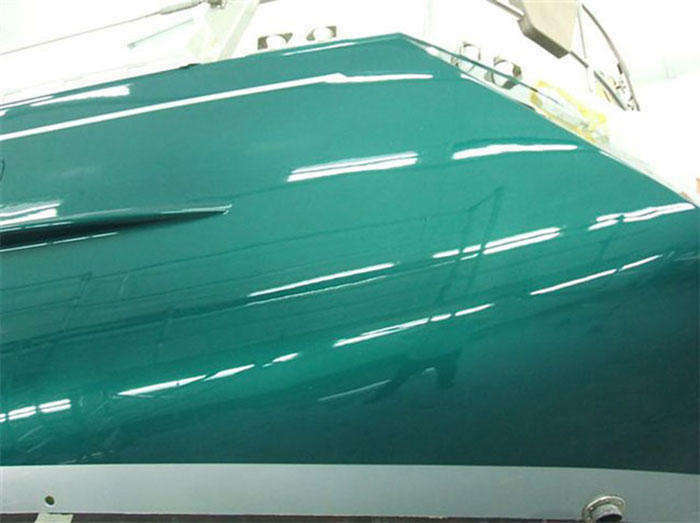 This was applied as a base colour followed by several coats of clear, which gives a deep glossy shine. The colour of the lines were silver metallic; very modern-looking and very different, subtle and elegant. The metallic paint has a very pleasing effect, as it looks different depending on how you view it in relation to the light; subtle changes in the green tone and the silver of the metallic shining through. The high gloss shows the reflection of the booth lighting and staging (figure 4). 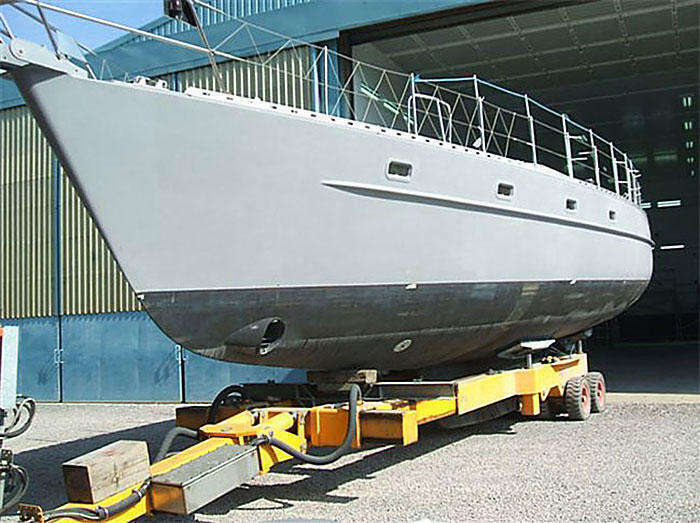 Below’s photo (figure 5) shows Truant moving out of the paint shed with an inset of her earlier primed state.